While G Suite has grown to provide more tools, functionality and value, the one thing that hasn't changed over this time, is the price. More than a decade ago, Google introduced Gmail—their first cloud-native productivity app—to help make email safer and easier. Since then, they have pioneered more ways for teams to collaborate in real-time with products like Google Calendar, Docs, Drive and Hangouts. Together, these apps make up G Suite, a set of intelligent, secure productivity and collaboration tools. 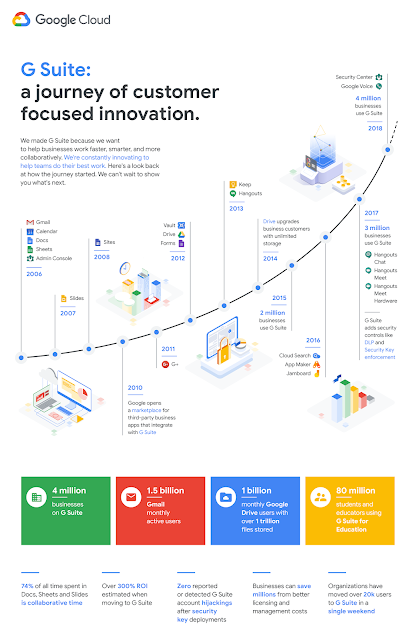 Since then Google has brought businesses more than a dozen new G Suite services to help reimagine the way we work, including powerful video conferencing (Hangouts Meet), secure team messaging (Hangouts Chat) and enterprise-grade search capabilities (Cloud Search). Google also infused their products with advanced artificial intelligence to make it easier to respond to emails, gather insights from data and protect against phishing attacks before they happen. With this in mind, Google recently announced two incremental price updates to reflect the fair value of the G Suite set of services. Starting on April 2, 2019, G Suite Basic Edition will increase by R15 (from R80 to R95 per user/month excl. VAT) and G Suite Business Edition will increase by R30 (from R140 to R170 per user/month excl. VAT). Pricing for G Suite Enterprise Edition customers will not change. For existing G Suite Basic or Business edition customers on the monthly plan, the new list prices will go into effect on April 2, 2019. For customers on the annual plan, the new prices will go into effect the first time their plan renews on or after April 2, 2019. These changes will not impact current contracts or any renewal events prior to April 2, 2019. We are grateful for the many businesses that use Cozan Consulting and G Suite to empower their teams to work collaboratively, and we remain committed to helping our customers succeed.